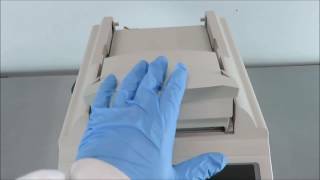 The Applied Biosystems Geneamp 9700 PCR system is specifically designed for high sample volume amplification of nucleic acids. The ABI 9700 thermal cycler consists of a base module and an interchangeable sample block. The heated lid and unique thermal isolation frame ensures oil free operation in the 0.5µl format. These applied biosystems thermal cyclers are designed for use with 0.2ml reaction tubes or 96 & 384 well reaction plates for all routine PCR applications. The Applied Biosystems Geneamp 9700 PCR system features an easy to use graphic interface with intuitive programing, interchangeable blocks for flexible use, and fast, uniform thermal response. This ABI GeneAmp PCR System 9700 is in excellent working condition. All of our lab equipment comes backed with our standard warranty. Should you have any questions, please don't hesitate to contact us.